Evan Arambula and Jacob McCarter qualified to compete in the state track and field meet this past weekend in Stephenville. Evan will be going in the 800 m run and the 1600 m run. Jacob qualified in the 300 m hurdles. The state meet will be held on May 11 & 12 in Austin. Congratulations to all those who competed at the regional track meet. There were many personal bests recorded at the meet. The softball and baseball teams will be competing for bi-district championships this week. The softball team will face Sunnyvale today in Kaufman and the baseball team will play a best of three series against Mildred later in the week. This is Teacher Appreciation Week. I want to thank all of our teachers for their hard work and dedication. Our teachers are truly second to none! They work each and everyday to provide our children with a world-class education. The EISD bands will be performing in their annual Spring Band Concert on Tuesday. The concert will begin at 7:00 PM with the beginning band. The 7th and 8th grade band will perform next, followed by the High School. There is no admission charge. Everyone is invited! National Geographic Education is an educational site, currently in Beta, created by National Geographic. National Geographic Education is working to increase geo-literacy skills in kids, helping them to learn how the world works and how people and places are connected. National Geographic Education offers incredible educational resources including rich media materials and scientific exploration for both student and teachers. National Geographic Education is a site that would be a great resource for the classroom. Worth checking out! Have an iPad and not sure what to do with it? 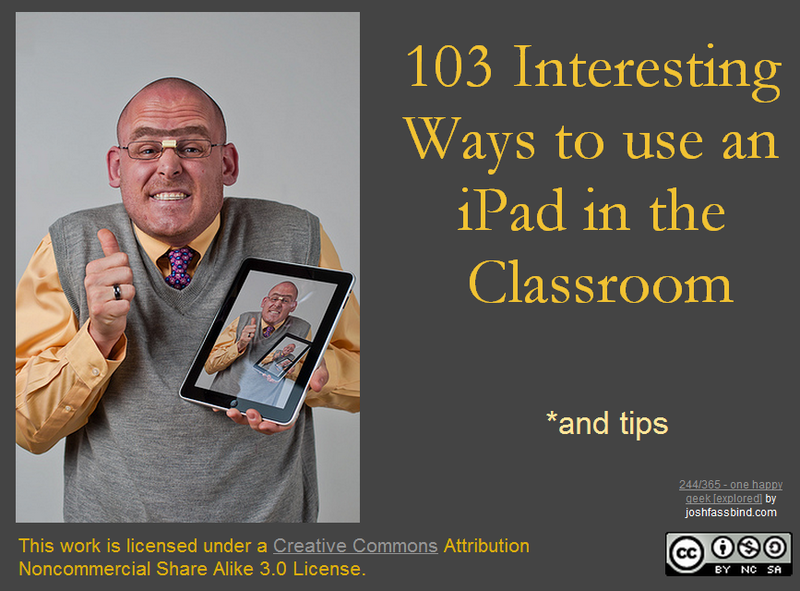 Then 103 Ways to Use iPads in the Classroom is a resource you should check into for some great ideas. 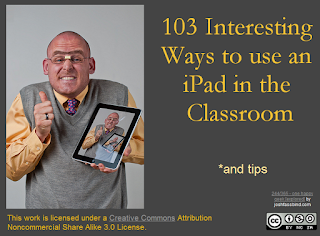 103 Ways to Use iPads in the Classroom suggests apps (some free; some not) and then includes ideas of how to incorporate these apps into the classroom. 103 Ways to Use iPads in the Classroom has suggested lessons and apps that include basic subject area content as well as suggestions on music, making movies, converting speech to text, and many others. You can see other interesting Ways presentations that Tom Barrett has created on the Interesting Ways page on his Blog. If you are always on the look out for some good apps, then check out the Google spreadsheet created by TCEA, TCEA Recommended Apps, a collaborative effort by TCEA and many others. TCEA Recommended Apps contains two sheets. The first lists numerous educational apps, both free and many others that quite affordable. The TCEA Recommended Apps spreadsheet offers apps in every subject area and all grade levels. There are also specialized apps listed for foreign languages, special needs, study tools, and teacher tools. The second sheet of the TCEA Recommended Apps spreadsheet lists personal apps that cover topics such as news, cooking, photography, technology and weather. TCEA Recommended Apps is a fabulous tool that will help make your iPad a more personalized and effective tool. I recommend checking it out and contributing as well. Cookie is a fun site for kids in grade PreK to 2nd grade, offering interactive online games, videos, worksheets, and even arts and crafts. Cookie offers games focusing on math, language, phonics and science to help kids build their skills in these subject areas. Along with the many interactive games offered, Cookie also provides a variety of worksheets covering letters, numbers, calendars, seasons, and animals. Cookie also offers a variety of videos. These videos cover topics such as personal hygiene, the five senses, life cycles, and food chains. The Cookie videos are designed with the younger learners in mind. I learned about from David Kapuler’s blog, Technology Tidbit: Thoughts of a Cyber Hero. Cookie is definitely worth checking out. In a post from a few months ago, I briefly mentioned a project sponsored by the Texas Higher Education Coordinating Board called Generation TX, or GenTX for short. GenTX main purpose is to provide high school students in Texas with information about college attendance. Everything from planning to paying for college is discussed on the GenTX website. A detailed planning guide takes you through the steps for preparing and applying for college from 9th grade through 12th grade. In addition, there is a vast amount of information included on financial aid. I would encourage everyone to visit this site and take advantage of all of the information that has been assembled in one place. The website address is http://gentx.org/. If you have questions about any of the materials on the website, or just need further information, I encourage you to contact Phyllis Bice or Gwen Orr at the High School. This week brings us the second round of TAKS and STAAR testing. Although not orginally scheduled for today, the 10th and 11th grade students will be taking their social studies TAKS test today. As discussed last week, this change was necessary because several of our 10th and 11th grade students had qualified for the regional track meet, which will be held on Friday and Saturday of this week. Recognizing this conflict, the state gave us an option of moving this test to today. Updates will be posted about softball and baseball when information becomes available. EHS was recently informed that Shelby Stegent, a senior at EHS, had successfully passed all three portions of the Texas State Florists’ Association Floral Design certification test. With the successful completion of the High School Floral Certification, Shelby becomes a TSFA student member and is entitled to all benefits of student membership. Shelby will be awarded a certificate of accomplishment and medal for her hard work. Earth Day is on April 22 and blogger, Keith Ferrell, has pulled together some great resources for this special occasion in 7 Earth Day Sites You Didn’t Know About. Not planning any Earth Day activities?? Ed Tech Ideas is still a site is well worth the visit for teachers and students alike. It includes oodles of links to some great educational sites, all neatly organized for easy access. For example: 11 Sites for Fraction Practice and 60 Educational Games Sites That You’ve Probably Never Seen. I found this site today through Twitter from TCEA. Stay connected and learn!! Due to conflicts with the regional track meet, EISD 10th & 11th graders will take the TAKS Social Studies tests on Monday, April 23, 2012 instead of Friday, April 27, 2012 as originally scheduled. This change in testing was approved by the Texas Education Agency. The Lady Bulldogs will definitely take part in post-district competition. Right now, we are not sure of their first round opponent because of the need of a tie-breaker game in the other district. We will either play Malakoff or Sunnyvale in bi-district. The baseball team completes their season tonight at Scurry. A win at Scurry will put the Bulldogs in a tie with Malakoff for the final playoff spot. Right now, we are tentatively looking at a tie breaker being played in Athens on Monday, April 30. We will have more complete information as the situation continues to develop. Good luck to the students heading to Stephenville today to compete in the UIL Regional Literary Meet. The participants include Nic Hairl – Headline Writing, Whitney Frosch – Ready Writing, and Grace Holcombe – Ready Writing. A reminder that EISD will be hosting a regional qualifiers track meet today. We are expecting about 400 track and field athletes from schools throughout our area, North Texas, North East Texas, and East Texas. There will be some of the best track and field talent in the state at this track meet. There is no admission charge. Everyone is invited to come out and enjoy this event. Field events begin at 3:45. 3200 m run begins at 4:00. Running finals will begin at 5:30 or after field events. Congratulations to Jacob for this honor! Also, thanks to Coach Kenneth Henderson for sharing this information.